Newborn Screening Saves Lives Act, Bill S.1858 / H.R. 3825M, was signed into law (Public Law 110-204) by President Bush on April 24, 2008. Although it was signed into law, it has not yet been funded—$44.5 Million. It is estimated that if we do NOT implement Universal Comprehensive Newborn Screening the cost will exceed a Billion dollars annually. We can’t afford to lose anymore BABIES! Please HELP! Contact your State Newborn Screening Laboratory: This link will show you who the contact person is for your particular state by clicking on this link State Lab Contact Information and selecting the state you live in. 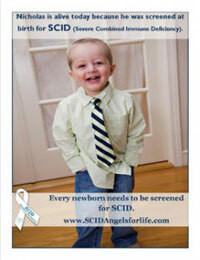 Contact them and offer to help them learn about SCID. Share a brief story with them regarding your experience with SCID. We need to help them understand why this is so important. In order to find out if there are currently any bills regarding NEWBORN SCREENING in your state click on this link and see: Bills The first thing you need to do is click on your state. You’ll see first listed is the state, the bill number is next, followed by a brief description of the bill and the current status of the bill. So if you see there is a bill in your state regarding newborn screening for SCID, you will certainly want to send a letter to your representative and see how you can help to get this bill passed.